A dirty little war is grinding on in northern Syria, off the West's radar and beyond the reach of much of its media, writes Jonathan Spyer, who has just returned from a visit to the besieged Kurdish enclave of Kobani. The conflict between the jihadist Islamic State of Iraq and the Levant (ISIS) and the Kurdish upstarts provides a glimpse of what the future might hold for the country, now in the fourth year of a punishing civil war — wars within wars. Syria is now fractured into a multitude of interests, split along ethnic, religious and regional grounds — and each badly disposed to the others. Last year, Syria's Kurds seized the opportunity to declare independence from Damascus in areas along the border with Turkey. Today, they control three separate enclaves — Jazira, the largest, in the northeast, Kobani and Afrin. These are among the most peaceful and well-governed areas of the country. In Kobani (Ayn Al-Arab in Arabic), about 80,000 people live under the rule of a Kurdish administration dominated by the Democratic Union Party (PYD), a movement closely allied with the separatist Kurdish movement, the Kurdistan Workers' Party (PKK), in neighbouring Turkey. However, the enclave has the misfortune of being located in an area the ISIS is eyeing as part of the Islamic state it is seeking to establish — a wide swath of territory from Anbar and Ninawah provinces in western Iraq through eastern Syria to the Syrian-Turkish border. 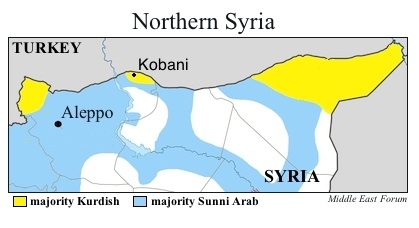 It already controls a substantial part of eastern Syria, lapping around Kobani. Now, the area is under siege, as the Islamists seek to starve the Kurds into submission. Jihadi fighters assault its borders with a daily barrage of mortar fire and sniper activity, and occasionally launch all-out ground attacks. ISIS is the most brutal and extreme of the political-military organizations engaged in the civil war in Syria, ostensibly against President Bashar Al-Assad, but in reality against anyone who does not follow their extremist brand of Islam. Residents of this new Islamist state are living in conditions of extraordinary brutality. Christians in Raqqa must pay a special tax — the jizya — in accordance with Shariah law. Anyone caught drinking alcohol is imprisoned and tortured. The road from Raqqa to Jarabulus, another town that has fallen to the Islamists, runs through the Kurdish-controlled area. Abu Omar al-Shishani, a Chechen and one of its most capable field commanders, has vowed to drink tea and pray in Kobani, which his movement plans to rename Ayn al-Islam. The Kurds are determined to prevent this. Entering Kobani is not easy, surrounded as it is on three sides by territory controlled by ISIS; the fourth, its northern edge, runs along the Turkish border. But the Turks have no great love of the PKK-linked enclaves after years of trying to crush their own Kurdish population. As a result, the border is more strictly policed than the line facing Arab-populated areas of Syria further west. Kurdish smugglers do a risky and lucrative trade, bringing people and supplies into the enclave, usually under cover of night. Once in Kobani, the reality of life under siege quickly becomes apparent. ISIS has cut off electricity, so power is only available part of the day through generators. Water has also been cut off, although new wells have been dug throughout the enclave. Most food has to be smuggled in, which accounts for the residents' meagre and Spartan diet — mainly canned fish, tomatoes and other vegetables they grow themselves. Medical supplies are also growing scarce. At the Ayn al Arab hospital, once of two such facilities in Kobani, there are few incubators for ailing newborns and no dialysis machines for patients with kidney disease. The equipment they do have seems old and dilapidated. "We're short of equipment here, and short of drugs," said one doctor. "But we improvise, and we innovate, and we don't die." The problem is compounded by the uncertain political status of the enclaves. Affiliated neither with the Assad regime, nor the rebels, and opposed by Turkey, they can expect no help from their neighbours. International aid groups such as Doctors Without Borders also have to tread carefully, wary of complicating their relations with the Turkish authorities. The impact of all this on the lives of Kobani's inhabitants can be hard. Said Sharif, a refugee from the Sheikh Maksoud district of Aleppo, described how he was unable to take his four-year-old son to a Turkish hospital when the boy was severely injured after falling from a roof. Unconscious but alive, the child was finally allowed across the border after a 48-hour wait. Yet with all this, the enclave appears in no danger of imminent collapse. The education system is functioning. Its Asayish police force is present on the streets. There is, despite everything, an atmosphere of normality. There is also optimism. of the northern Syrian city of Aleppo, on April 21, 2013. "We can provide for ourselves from our land, even under siege. We can sacrifice," said Nuri, an ex-PKK fighter who works as an advisor to the makeshift Kurdish administration. "We're ready. We won't attack anyone, but if attacked, we can and will defend ourselves." Meanwhile a cat and mouse war of attrition grinds on. In Tel Abyad, on the eastern edge, the villages were largely deserted and the YPG fighters moved carefully around their positions, mindful of the ever-present threat of snipers. On the western side, near the town of Jarabulus, the YPG's positions adjoin still-populated areas. During an interview with Nohalat Kobani, its commander, the group's redoubt in Haj Ismail village came under attack from ISIS small-arms fire. The young fighters raced to their positions and fired back for some minutes. Then, everyday life rapidly returned. 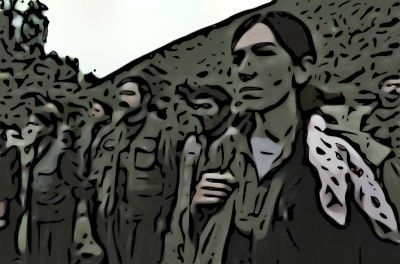 For their part, the Kurds combine a studied contempt for their opponents' tactical abilities with a sort of fascinated horror for some of their practices. "They cut hands, cut heads, play with corpses," said one female fighter. "Many of them are on drugs. They attack randomly, haphazardly. But they can't progress into our areas." A male fighter was more succinct. Asked about the Chechens who make up a significant portion of the jihadis' manpower, he replied, "They are monsters." Despite the siege, Kobani looks well equipped to survive for the foreseeable future. But the largely unnoticed war here offers broader lessons for the likely direction of events in Syria..
Two formidable organizations, with irreconcilable goals, have established functioning enclaves in part of what was once Syrian territory. ISIS's area of control extends far into western Iraq, rendering the border between these two countries largely fictional. Both enclaves have the ability to survive. They are at war because ISIS is trying to destroy one of the three Kurdish areas, to "rationalize" its area of control from south to north. For their part, the Kurds would like to "unite all the cantons" from west to east, says Nuri. Legitimate issues have been raised regarding the authoritarian tendencies of the PYD. But the Kurds are running the most peaceful part of Syria. ISIS, meanwhile, presides over a bizarre and brutal Islamist emirate. But for both organizations, the presence of Mr. Assad further south and the other rebel organizations to the west are not the issues of paramount importance. The war between them is an indication of the extent to which Syria has ceased any longer to consist of a single state, or even a single war. Wars within wars and states within states is the reality of Syria today.